Looking to add a little excitement to your night riding? Tire Flares may be the answer! These LED wheel lights screw on to the valve stem of a motorcycle (or bicycle, car, etc.) and automatically activate at night. The tiny LED light in each Tire Flare automatically activates on while the tire is rotating and shuts off within about 5 seconds or so when the tire stops. The Tire Flares don’t flash, so the continuous light forms a “light circle” as the tire is in motion, providing a wonderful effect. 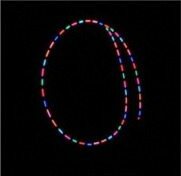 The multicolor version of the Tire Flares throw out short pulses of very intense neon-like colors of red, blue, amber, purple and green, and as the tire spins faster, the colors sort of merge into each other and form other colors and a really cool rainbow-like light (see photo below). 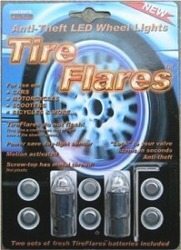 Tire Flares come two to a package. Each Tire Flare has four AG8 button watch batteries included, and 6 more batteries are also provided in the package. Battery life will probably vary, but is claimed to be about 200 hours. LEDs take very little power, and although I haven’t used mine for anywhere near 200 hours, the batteries haven’t run down yet either. Each Tire Flare has a very small hex screw in the metal barrel, and the provided hex wrench allows the Tire Flare to be tightened against the valve stem to help prevent theft and to help keep it in place. They’re very easy to install: first unscrew the top of each Tire Flare to remove the plastic shipping protector covering the batteries. Screw the clear dome back on, install the Tire Flare on the valve stem, tighten the hex screw, and you’re ready to go. By the way, the clear dome also has a small O-ring to help prevent moisture intrusion. The Tire Flares weigh about 11g (3/8 oz.) each, so there’s a possibility that you may have to re-balance the tire, but I didn’t notice any problems on the bikes that we tried with Tire Flares installed. Also, some bikes have very large disk brakes that may hide the Tire Flare’s LED light. 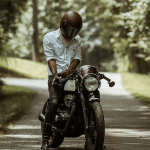 My Triumph Thunderbird Sport is a good example — the combination of 17″ tires and large diameter dual front disks means that the Tire Flare is hidden behind the disks and the effect is muted. By the way — I don’t think it’s a good idea to install any type of device on a 90 degree valve stem. Any type of spinning weight on a 90 degree valve stem has the potential of separating the valve stem from the trim, which could have nasty results at speed. They work great, however, on my ’86 BMW R65, with its 18″ wheels and single small front disk (and drum rear) brake. I didn’t try the Tire Flares on a bicycle, but I bet they would work great with a bicycle’s huge tires — the kids would probably love a pair as a Christmas stocking stuffer! I tried everything I could think of to get a good photo at night as the bike rode by, but between the bike’s headlights and background lights in the neighborhood, I couldn’t duplicate the effect that is seen by the naked eye. So this photo is a rough illustration of the color output from the multicolor version of the Tire Flares. I spun a single Tire Flare around in the dark with the camera’s shutter on self-timer. Tire Flares are a cool novelty item that can really attract attention. They add a bit of fun to night rides, and they sure draw a lot of stares. I’m not sure if this type of lighting is legal in all jurisdictions, but they’re easy enough to remove if necessary. And who knows — maybe they add to nighttime safety by making the motorcycle more visible? Oh, and one more thing: Make sure you concentrate on riding, and don’t try looking down at your own tires! Available From: LightWave (UK) Suggested Retail Price: £12.95 – £12.95/pr. Colors: Red, white, blue, green, amber, purple or multicolor. Product Comments: Very cool lighting effect for motorcycle or other tires. Screws on to valve stem; continuous (non-flashing) LED light. Automatically turns off during daylight. The multicolor Tire Flare looks great!